Every once in a while, it’s useful to look at the state of the automobiles that your family owns and ask some hard questions about upcoming costs, both in terms of repair and eventual replacement. I thought I’d walk through these questions as they relate to our own cars to provide some ideas of what you might want to be thinking about. We try to revisit these questions a few times a year. 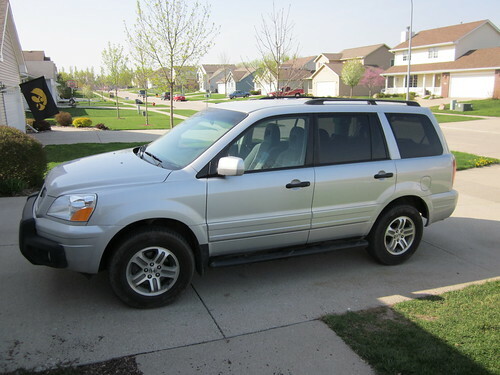 We purchased our Honda Pilot off of Craigslist for cash in April 2010. It was actually a very easy purchase, as they took the vehicle we were replacing off of our hands at the same time for a reduction in the cost of the Pilot. Our objective with this purchase was to have a reliable car with plenty of space for our family and other items. Fuel efficiency isn’t as important as this isn’t intended as our high mileage car. I do not need it for commuting as I work from home. It’s primarily used for situations where I need to go somewhere in a pinch during the day and for family travel. We have put an average of 5,500 miles per year on the car since purchasing it. Given the expected lifespan of the car (around 150,000 to 175,000 miles), we are looking at replacing it in approximately six years. There are no major maintenance milestones coming up on this vehicle. Our objective for buying the Prius was that we wanted a reliable and highly fuel efficient car for her commute, as we anticipated fuel costs well over $3 for the foreseeable future (something which proved true). Space was a much smaller factor with this car – we wanted to be able to squeeze our family in if needed, but space and comfort weren’t really important. The car is intended for commuting – it doesn’t need to be big, but it is going to put on a lot of miles and it needs to be reliable. We have put an average of 16,000 miles per year on this vehicle since purchasing it. Given the expected lifespan of the car (around 150,000 to 175,000 miles), we are looking at replacing it in approximately five years. This vehicle will likely need a battery replacement in one to two years, which will be pricy ($1,000 or so plus labor). I’m going to stick with major automobile expenses over the next decade. We have a major expense for the Prius coming up in, say, 2015. Let’s estimate that it will cost $1,500. We will likely replace the Prius in, say, 2018. We will want to replace it with something similar that can rack up the miles with several years of reliability. Let’s estimate our expense here is $15,000 – I am probably estimating high since our plan is to buy a late model used replacement. We will likely replace the Pilot in, say, 2019. We will want to replace it with something similar that can handle the space needs of our family during the teen years. Let’s estimate that our expense here is, again, $15,000 – again, this might be a high estimate, but I’d rather estimate high than low. We will likely purchase another car in 2021 for our oldest child’s commuting needs. A used car is appropriate here – let’s figure $5,000. After that, we will likely purchase a car in 2023 for our next child. Let’s figure $5,000 for that one, too. So, what does that translate into? To make the repair goal for the Prius, we will need to save $80 per month starting right now. This will give us $960 in a year which, along with interest, should get us to our goal. To make the replacement goal for the Prius, we will need to save $250 per month starting right now. That will give us $15,000 in five years which, along with interest, should get us to our goal. To make the replacement goal for the Pilot, we will need to save $200 per month starting right now. That will give us $14,400 in six years which, along with interest, should get us to our goal. For our oldest child’s car, we need to save $50 per month. For our next child’s car, we need to save about $45 per month. What does that all mean? We should be saving about $600 per month starting right now. In one year, we can cut that down to about $500 per month until we hit our car replacement cycle at the end of the decade. This seems like a lot of cash, but it’s important to remember a few things. First, by avoiding loans, interest is working in our favor. The money we save will generate interest as we go along and we will never be paying interest on a car loan. Second, our replacement goals are fairly lofty. We can easily lower our expectations and costs for replacement cars by accepting somewhat older cars. We don’t want to replace junk with junk, of course, but we’re anticipating buying late model used cars and again driving them nearly into the ground. Third, our children don’t need cars. That expense is a convenience for their own commuting when they come of age and also an opportunity to teach them about responsible car ownership. That expense has some likelihood of never occurring. In other words, we are knowingly shooting for the high end rather than the low end of our goal. The reason? When we reach our destination, it’s far better to find that we have more saved than we need than not enough. What does this mean for you? It’s worthwhile to go through these thoughts regarding your own cars. How long will your current cars last? Are there any major repairs on the horizon? How much will replacements cost? How much would you need to save each month starting right now so that you can just pay cash when the replacements arrive? A little bit of planning can make a huge difference when it comes time to buy a car.